Turtle eggs case is settled | Daily Express Online, Sabah, Malaysia. 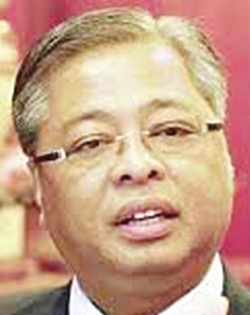 Kuala Lumpur: The suit filed by former Rural and regional Development Minister Datuk Seri Ismail Sabri Yaakob (pic) against the publisher of Daily Express and the newspaper editor, James Sarda, in connection with the publication of three articles on turtle egg dish allegedly served at an event in Sabah, has been resolved amicably at the High Court. This was conveyed to the media by lawyer Bhag Singh, representing Sabah Publishing Sdn Bhd and Sarda, after the case management which was held in chambers before judicial commissioner Darryl Goon Siew Chye, who also recorded the settlements. However, the terms of the settlement were not revealed to the press. Also present during the proceeding was Ismail Sabri's lawyer, Samsinaralia Sahar. Ismail Sabri filed the lawsuit on March 30 last year at the Kuala Lumpur High Court, claiming that Sabah Publishing and Sarda had wrongfully and maliciously published three articles in the Daily Express on protected turtle eggs served at a dinner function in Kota Kinabalu, Sabah, which he attended in 2015. In his statement of claim, Ismail Sabri stated that the defamatory words against him in the articles titled "Minister and Sabah YB have yet to comply: Dept" dated Jan 24, 2016; "Beluran turtle eggs dinner: Findings left to the AG" dated Sept 3, 2016; and "Explain turtle egg confusion first, Lim tells Minister" dated Sept 6, 2016, were wrong, baseless, ill-intended and had tarnished his reputation as a politician. He had sought an apology from the defendants, as well as RM10 million in general, aggravated and exemplary damages. Sabah Publishing and Sarda, in their statement of defence, denied publishing and printing the articles with wrongful and bad intentions. They said the articles published were produced under qualified privilege and with no malice. Sabah Publishing and Sarda had applied to strike out the suit, but was dismissed by the High Court Oct 9, 2017. They appealed to the Court of Appeal, but failed again.